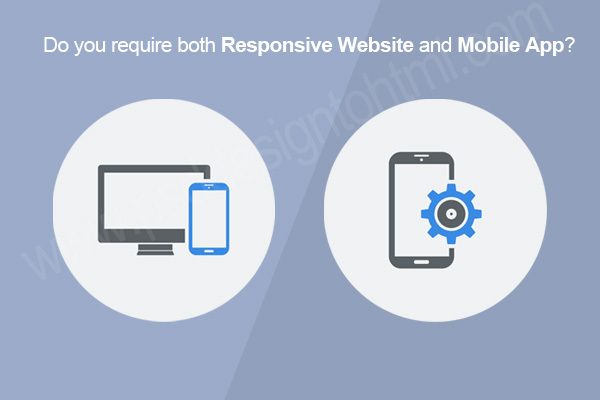 Do You Require Both Responsive Website Design and Mobile App? The dilemma between choosing a responsive website or mobile app is what a business goes through more than the technical capacities that each platform offers. It is because the customers accessing your business from a desktop computer can also connect while they are on move with the help of their smartphones. For business entities, mobile apps are now another medium of reaching out to their customers, similar to a responsive web page and an advertisement. There is not any question about the one or the other. In fact, you do need both! You need it in order to reach the two kinds of customers – the ones browsing from their desktop computers, and the ones who are on the go. The purpose of the mobile app is to engage the customers so that they can keep getting back to your brands for more. It might happen that you wish to build one of the platforms first, rather than both at once. Build a platform-first website. In case you got a non-technical business delivered via technology (for instance, Uber and AirBnB), it might be a huge dilemma whether to choose a responsive website design or app first. The solution depends only on your business’s target audience. What would be the best way to reach out to your target audience? How are your target audience performing tasks currently that you are wishing to simplify? The answers to these questions would determine if you should go for mobile or website first strategy. Except if you are building a utility or productivity tool which is required to be on the move, like an app of to-do list, or for apps that do not need the internet connection to work. Although, if you are building for one platform at first, you can never disregard the other one. The other one can be your value addition. For example – Instagram, that was mobile-first then was built as responsive website design. Experiment with mobile platforms. There is iOS, Android, as well as Windows. If you cannot be certain about the mobile platform you wish to go for, as building for all the platforms is way too expensive making iterative development tedious, a responsive website can be your rescue! Website enables all the mobile OS. You just build once and get all platforms covers, and not just desktops only. It aids in validating the traffic source. You ought to build product with integrated analytics for getting a sense of traffic flowing from various devices. After you figure out which device your customers use more often for accessing your responsive site design, you can easily build your customized mobile app accordingly. Brand Showcase. A responsive website can disseminate more information, educating customers regarding the brand and what it offers. It helps you to cover both the sides. You can be reached through your desktop users as well as the ones who are on-the-go. Even though you are building a website for informing your audience regarding your brand, you can also engage them as well as new prospective through a mobile-based app. You can build your mobile app enhancing brand value, for instance Coca-Cola did so offering its exciting iOS app. You can find apps as such by banks or airlines letting you perform several tasks at a quicker pace and while on move. There is no debate between mobile app and website. When you build a website, you have to make it responsive design, enabling mobiles and tablets. If you do not go for any mobile app, you would be losing a vast potential audience. The author is an extraordinary blogger working at psddesigntohtml.com focusing on psd to html responsive conversion. He tries his best to give back to the world with his immense knowledge of the World Wide Web, sharing his ideas and beliefs as well as tips and tricks. He is great at what he does. If you integrate a responsive CSS framework like bootstrap? It isn’t available offline I guess but it covers all major platforms.